For those of you keen to get in and explore the new Learning Space we’re offering training sessions from the 3rd of September. To view available times and book your place you’ll need to sign up. In return we’ll give you exclusive access to the new system and you’ll be ready to start using the Learning Space in preparation for next term. You’re lying on a beach, eyes wide shut, coloured flashes fizz & ping across your eyelids. Turquoise wavelets lap over a crescent of baking, white sand. Your frosted glass, chinking with ice, is raised unsteadily and docked to your parched lips. You gulp back half a tumbler, greedily. Life is good, and you deserve this… Too good, perhaps. Somewhere deep in the foggy nethers of your soft-boiled brain, is a concern that will not be silenced. “Did I leave the iron on, face down over fireworks? Or the dog in the back of the car at Gatwick multi-storey? Is one of the kids missing? Have you counted them since you arrived? Seen them? Do you even have any kids? ?” But no… It’s nothing – you reassure yourself, settling back down. Several sunbathers look on, bemused, when you leap onto the hot sand like a scalded cat. The truth has arrived – a diamond bullet through your cortex! Relax. Keep working on the mahogany tan. We’re here throughout the summer, and never more than a phone call away. So don’t be a stranger, speed-dial ET (not the lovable, fugly movie star) and ask us to help. Even if you don’t know who or what ET is (again, not the stumpy guy with lights for fingers). Educational Technology – we’re here all summer. Book a training place, if you want to discover more about the new Learning Space. 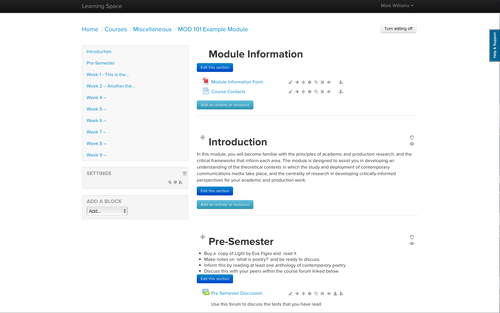 Those of you that are accessing the new Learning Space will be noticing that we’ve applied our first round of functionality improvements. Our Learning Information Designer has been working feverishly behind the scenes making the overall experience much clearer and more intuitive. 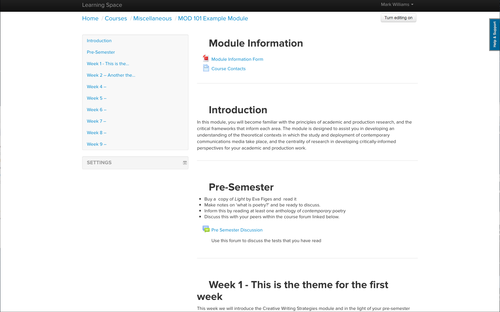 In the the left side menu we’ve introduced a new menu to allow users to navigate the module by week or topic. This will come into its own at a later date when we switch to sideways navigation as opposed to the old ‘scroll of death’ top down navigation. The right side tab in blue opens up our knowledge base. From now you won’t have to go anywhere else to ask a question or browse to see if your query has been answered by someone else. Awesome-o! Next up you’ll see what we’ve done with editing. Click on “Turn Editing On” and you’ll be presented with some chunky new buttons that make it easy to see what it is that you are making a change to. “Edit this section” takes you into the week/topic editor and “Add an Activity or Resource” still does what it says on the tin. Simples! Scorcher! Are Team ET responsible for the glorious weather? As Falmouth basks in the continuing sunshine, so Team ET have been turning it up a notch with The Move. 235 modules are now bathing in the welcoming rays of the new Learning Space, that’s well over 1/3 of the way through and we’d like to express our thanks to all of the staff that we’ve spoken to so far. Over the last seven days we’ve had consultation and training sessions with Foundation Art, Journalism and Marine and Natural History Photography. Dance and Choreography is the latest course to move into the new Learning Space. So we don’t know whether the momentum of the project is perpetuating the clement weather, but we do know that our summer move is Hot! Hot! Hot!